What a magical time of year Christmas is and these Christmas ecards for business say it all. We all feel a certain kind of warmth when we see a lit up Christmas tree and this card design is full of them. 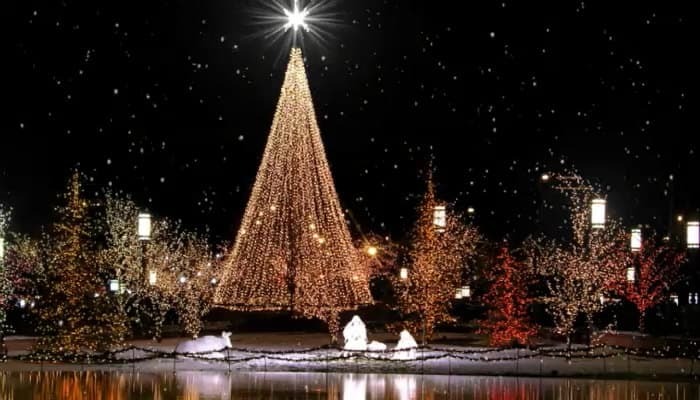 The warm white lights and dazzling star on the largest centre tree are the focal point for the card and really send that ‘Merry Christmas’ message. The lights are reflected within the water below which means the receiver gets double the joy from the image. To imagine a whole town dressed and decorated for the holidays is to imagine this exact image. It speaks of celebration, community and a peaceful time. In our opinion, there is no better time of year and what better way to pass on well wishes for the festive season than with this imaginative ecards. You can say everything you need to say with the click of a few buttons and it saves you having to worry about busy postal times or delays. For more of our Christmas holiday selection, take a browse through our other designs and you’re bound to find the perfect corporate holiday eCards!